Did you know about Simple English Wikipedia? 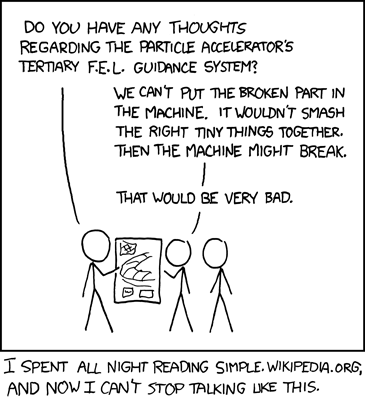 Xkcd is one of my most favorite webcomics of all time; they are short, simple and just about anyone who uses the internet can understand the jokes. New comic strips are published every Monday, Wednesday and Friday. I remember reading the article above and I was surprised that Wikipedia had a section dedicated to articles with simpler English phrases for those who may not necessarily understand technical jargon in many articles. The Simple English site is not as popular as the main site, so many of the articles may not be complete or detailed enough. I do refer to Wikipedia frequently and I always double check each article’s citations and determine what has been confirmed true; original research is a common issue in many articles. This entry was posted on July 27, 2011, 12:15 pm and is filed under Uncategorized. You can follow any responses to this entry through RSS 2.0. You can leave a response, or trackback from your own site.